Now that we have established a basic understanding of Culture and Language, we can focus on the field of Anthropology as a discipline. Anthropology is the study of the human species and its immediate ancestors (Kottak 2012). Specifically, anthropo means ‘human’, and ology means ‘science’. This offers a very broad and generalized scope for research, and anthropology is broad and generalized indeed. For the anthropologist seeking a research topic, the sky is the limit. An anthropologist might study the trade network of a group of people living on an island in the Pacific, the human genome, trends and patterns in the transmission of disease, the consumption of alcohol by the ancient Inca people, the ways that racial categories are defined differently in different parts of the world, or the social networks of stock traders on Wall Street. As a graduate student, I conducted anthropological research in Alaska, Florida and Morocco. After my first year of graduate school, I spent four months in Glacier Bay National Park recording oral histories from elder members of the Tlingit community in a small island village called Huna as part of a park program to identify indigenous place names and histories within park boundaries. In Florida, I used resident interviews, case-study analysis and historical documents related to Hurricane Opal to analyze the social conditions that contribute to hurricane vulnerability in coastal communities in Florida. 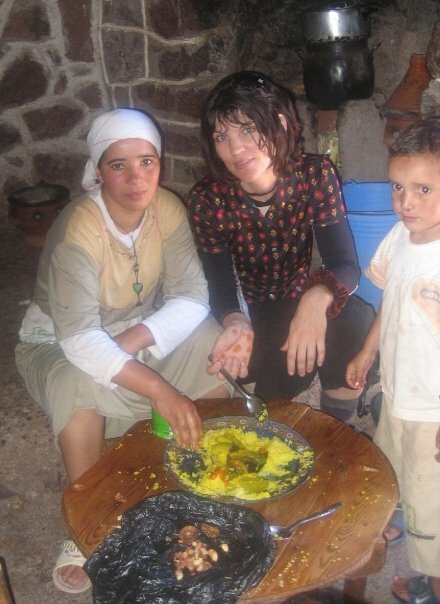 My dissertation research took place in an Amazighe (Berber) village in the High Atlas Mountains of Morocco from 2005 until 2008. I studied the ways that a new tourism economy changed social relations among people living in the village. My research generated findings related to the role of gender and kinship in economic relations in the village, how television-watching among women changed consumer practices in the household, the ways that clock-based time used by tourists conflicted with different forms of time observed by residents, and how tourism labor created identity conflicts for workers who spent more time with an international body of tourists than in their village or with their families. holistic; it investigates the whole of the human experience exploring the interactions of various phenomena that shape the human experience, both past and present. 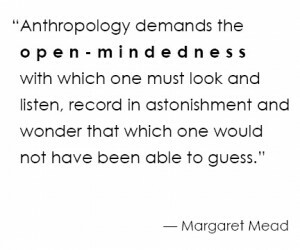 Because of this, anthropologists often draw from other disciplines and engage in interdisciplinary research by collaborating with scholars in a wide range of areas. In the United States, the field of anthropology is loosely divided into four, oftentimes overlapping, subfields: Social / Cultural, Archaeology, Linguistic, and Biological. Social and Cultural anthropologists study contemporary social relations and cultural behavior. A socio-cultural anthropologist not only describes, analyzes and interprets human difference, they must also explain the context from which those differences emerged. Therefore, a socio-cultural anthropologist must also draw from other disciplines such as history, geography, political science and other fields in order to better understand the topic they are investigating. A socio-cultural anthropologists uses ethnography and/or ethnology to research specific phenomenon. Ethnography: The anthropologist will engage in fieldwork to document and record information in a particular community, society or group. Oftentimes, the anthropologist will engage in participant-observation by joining in activities with the people they are investigating and then recording descriptive observations of the participatory experience. During my research for example, I participated in agricultural labor with women. During those activities, I not only experienced that daily agricultural work was seriously arduous, I also observed how agricultural labor helped forge ties among women who worked together. Women who worked together in the fields also gossiped together, confided in one another, and offered emotional support to each other. Fieldwork and participant-observation can help the anthropologist acquire information that is difficult to measure in surveys or interviews. Yet many anthropologists also use surveys and formal interviews to collect and gather information, and standardized data can make it easier to measure and compare information from different places. This is referred to as ethnology. Ethnology examines, analyzes, interprets and compares the results of ethnography in different places or times. Ethnology aims to generate generalizations about a specific phenomenon. Archaeologists reconstruct, describe, and interpret human behavior and cultural patterns in the past. Archaeologists may rely on material remains excavated from their research site, such as tools, household items, burials, and even coprolites (fossilized human feces) to generate conclusions about past human activities. Coprolites can provide evidence about ancient diets, and household items can shed light on the division of labor within the household. An archaeologist might rely on the items included in a burial to determine different class and social systems within an historical society.Materials can also give information about trade relations or migration patterns. Information generated by archaeological research, such as the digital story-telling of the Rosewood community, can contribute to the management and preservation of cultural resources. If you are interested in learning more about archaeology and participating in an archaeological field school, the University of North Florida offers a summer program for students and non-students. Click here for more information. Biological anthropologists study the biological experiences of human beings such as evolution, genetics, biological plasticity, primatology, etc. Biological anthropologists may rely on archaeological evidence of early humans to drawconclusions about the development of modern humans. In the Language section, we explored how genetics can offer insight into the development of language in humans compared to the call systems in primates. 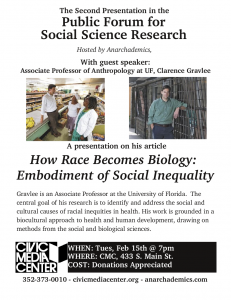 Medical anthropologists, such as Clarence Gravlee, have helped show how inequality can contribute to the prevalence of specific health problems within a community. When we address the anthropology of war in the fifth module, we will explore information produced by primatologists to understand the evolutionary role of conflict in human bonding. We already addressed the significance of language in society, and language is the primary focus in linguistic anthropology. By now you should be quite familiar with the roles and research of linguistic anthropologists who study past and present languages. 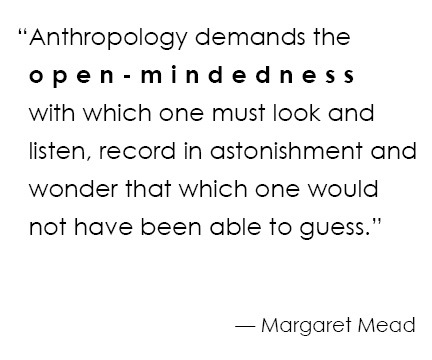 Within each subfield of anthropology, anthropologist can engage in academic and/or applied anthropology. The difference lies in the goals of the research and the intended audience. Academic anthropologists collaborate with other disciplines in the academic arena in order to contribute to a body of knowledge about the human condition. Anthropologists in academia can also participate in and contribute to applied programs and projects. Discussion: Evaluate the four fields of Anthropology; which field appeals to you the most and why? Would you take an applied or academic approach or integrate the two? 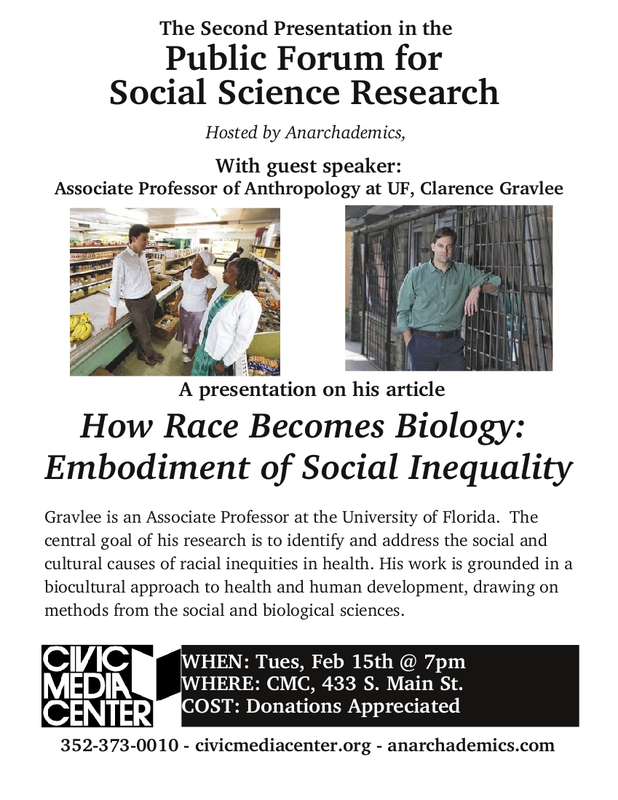 In what ways can you integrate anthropology with your current major? If Anthropology is your major, what are your future plans in Anthropology? When you complete the discussion, move on to the Ethics & Methods lesson.